The investment, which will take place in and around Akron over the next decade, includes a new 300,000 square-foot patient tower and main entrance to the hospital's main campus downtown. If city leaders had any worries about Summa Health's commitment to Akron, Ohio, the health system probably put those fears to rest when it announced it will invest up to $350 million in its facilities in and around the city over the next 10 years. “We thought long and hard about it,” said Summa president and CEO Dr. Thomas Malone, after announcing the plans to his coworkers and city leaders, including Akron Mayor Dan Horrigan. “We're making a big investment and the reason we're doing that is we've never been stronger, we're here to stay, we're going to be independent and we're going to lead the change in this community,” Malone added. A new 300,000 square-foot patient tower and main entrance to the hospital's main campus downtown. Increasing the number of private rooms available — so that they make up 80% of Summa's Akron beds. Increasing Summa's outpatient capacity system-wide. Modernizing key aspects of Summa Barberton Hospital, including enhancements to surgical services. Summa's Barberton Campus will likely be the first to see changes from the big spend. “In the first phase, we're investing $22 million down in the Barberton Campus, with a focus on the ambulatory services we have down there,” Malone said, adding that Barberton will also get new parking facilities and new imaging equipment. 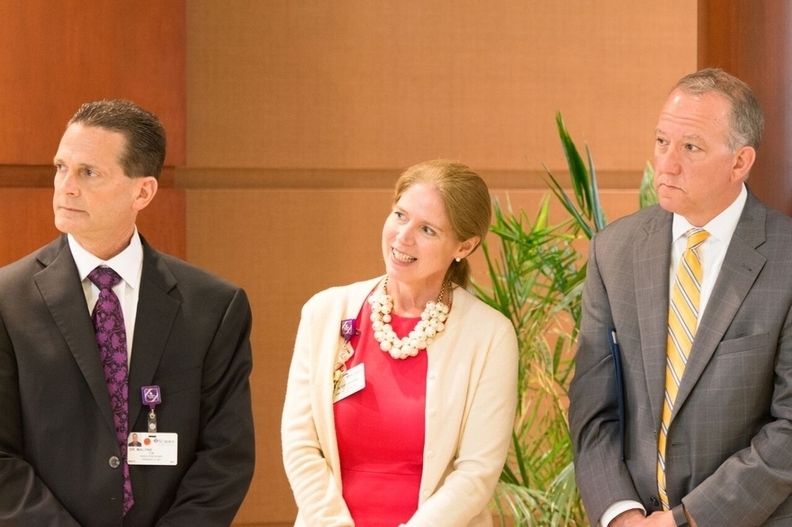 From left, Summa president and CEO Dr. Thomas Malone; Dr. Vivian von Gruenigen, chair of Summa's obstetrics and gynecology department; and Akron Mayor Dan Horrigan. But the biggest impact will be in Akron, where Summa has plans to spend about $270 million — possibly more. Most of that money is going to build a new six-floor, 300,000-square-foot facility. The hospital's breast center will move into the first floor of that building, while two floors above that will be devoted to women's health services, Malone said. Above that, two more floors will be used to provide more private inpatient rooms, which Malone said patients increasingly demand. “The last thing you want to do is to meet new people and their friends” when you're in the hospital, Malone quipped. The expansion represents an ongoing move by Summa toward services aimed at keeping patients well and out of the hospital, its persistent march further into women's health care, and its continued commitment to inpatient care in an era of aging patients, Malone said. Dr. Vivian von Gruenigen, chair of Summa's obstetrics and gynecology department, who joined Summa in 2009, said she's thrilled to see the new investments, especially in the women's health area. “Six years ago, we wanted to do this. We just weren't financially secure enough,” she said. Now, she said, the hospital is on sound financial footing and improving, especially in the area of women's health care. “We have proven that we're successful, that we're sustainable, our volumes are growing, our quality has improved – so by going to a new facility we can enlarge and further integrate – because right now we have some fragmentation challenges,” von Gruenigen said. It will take about three years before the new main building is up and running, Malone said. The footprint and budget have been determined, but now physicians and other staff members will get to have input into what goes inside and how it's set up, he added. Akron Mayor Dan Horrigan, who was on hand when Summa announced the expansion, said he's been working with the hospital in recent months to help plan and facilitate the additional investment. “This is great news for the city,” Horrigan said. One thing that hasn't yet been determined, Malone said, is what will happen to Summa's behavioral health services, which are now based at St. Thomas Hospital. Those operations might stay in St. Thomas, they could move into a Summa facility now leased to Western Reserve Hospital in Cuyahoga Falls — with which Malone conceded Summa has had a sometimes tense relationship — or they could go into another new $38 million facility that would be built on Summa's main campus. That will probably be decided in two or three years, Malone said. Until then, he and the rest of Summa have a lot of planning and construction to do on their just-announced concrete plans. "Summa Health announces $350 million investment" originally appeared on the website of Crain's Cleveland Business.